Hi, I am Kenneth, a regular Gentry player from Sint-Niklaas, and I would like to talk about my favorite deck in Gentry. Mostly I want to do this to show players that you don’t need creatures to win games, but also as an exercise to help me learn more about my deck and see if I can evolve it further. The deck I’m talking about is Blue/Red spells. The idea originated when Michiel (Van den Bussche) and I were trying to create a gauntlet for players to test their decks during the days of Shadows over Innistrad and Eldritch Moon, now 6 months ago. The original list we came up with relied on cards like Pore over the Pages, Fiery Temper paired with Lightning Axe and Thermo-Alchemist to dish out a lot of incidental damage and set up card / mana advantage. The list stayed mostly the same until the introduction of Kaladesh, which provided us with a new way to build our deck and a small subtheme that we could abuse with some of our uncommons to help us power through larger than average creatures. Where Shadows block had us force our card advantage and some removal through sorcery speed spells, Kaladesh provided us with more tools: Glimmer of Genius and Harnessed Lightning. These cards let us deploy nearly our entire game plan at instant speed. The main advantage of being able to play your cards at instant speed is that you’re capable of holding up your spells until the very last moment or in response to your opponent’s actions. That means they have to risk reacting to your cards before your own turn, which gives you the permanent threat of ending the game if they make a wrong move or try to counter one of your end-of-turn removal or draw spells. Enough introduction and explanation, lets move into dissecting our possibilities and come up with an eventual decklist. I’m a big believer in building around a game plan, so let’s have a look at some cards. If the sweepers in the format are rare/mythic and some conditional ones at uncommon that are often not very well-fitting in the metagame, what better way to finish your opponent than with a swarm of zombies? The deck is very good at putting a large number of instants and sorceries in your graveyard, which would give your opponent a grand total of two turns to either find an answer or kill you outright. Can you believe this card is uncommon? You can play more than one! Chandra, Flamecaller can hit the board running and take out a bunch of small to medium-sized creatures. It can also start doming your opponent for six. If you have junk in your hand, it lets you wheel it into something hopefully better. It is a very resilient and versatile threat, definitely worth the six mana and a rare slot. Bounce your stuff, here’s an 8/8 Octopus (Crush of Tentacles). What’s that, Reflector Mage is banned? This deck is full of one and two mana spells that let you surge this card for its full value. It’s a massive tempo swing even if they get rid of the tentacled monstrosity, and you have the removal to let it bash in for a lot of damage. The Octopus does die to Fatal Push or gets blocked by a servo; Making Crush of Tentacles the rare I usually end up putting on the chopping block if I need to change up my rares. Bedlam Reveler is a pretty good topdeck. If you have to cast this for more than RR, something’s gone terribly wrong. Sometimes it can be awkward as you may have to discard a finisher or a good draw spell, but in the other scenario, all you need to discard is a Fiery Temper or some lands you don’t want. It rarely survives very long as your creature count is very low and the few you do cast tend to eat an otherwise dead removal in most matchups, but it doesn’t need to live to do what it has to do, which is loading up your hand. I don’t think you can really call Fevered Visions a finisher, although if this resolves against a control/midrange deck you can usually call it finished. It’s a great example of a symmetrical effect and is very much capable of ending a game unopposed. Against aggro decks, you will want to discard it or scry it to the bottom as you don’t want to give them more cards. This deck has a lot of issues with trying to defend Planeswalkers and sometimes will have to take a hit to have the mana up for a draw spell end of turn. For that reason, I don’t think Jace, Unraveler of Secrets or Chandra, Torch of Defiance have the impact you want it to have, even if they may pound for pound be the strongest cards you can play in our little format. Chandra, Flamecaller on the other hand has a massive influence on the board, whether it’s clear or clogged. Another possibility is Torrential Gearhulk, but I feel like it would just eat an otherwise dead removal in game 1, at which point you’ve paid six mana to flash back a Glimmer of Genius. I’ve also tried Dynavolt Tower, but it didn’t quite have the lasting power I wanted out of my rares. Maybe my sample size was too small and it is strong? I couldn’t tell you! The last one is Metallurgic Summonings. It’s very much win-more. It’s a real gamebreaker in the midrange matchup or control mirror, much like Fevered Visions, but it comes down much later, making it very much susceptible to being countered and you getting behind in tempo. That’s about all of the cards I’ve bothered looking at, the current standard format doesn’t really offer much else in the way of rares or mythics for the deck. What else can you run? The most obvious goal I aim for here is consistency. The uncommons are so good I want to have a defined plan that I can pull off as quickly and often as possible. Glimmer is a great draw spell, it’s instant speed, it digs you into lands to hit your land drops or helps you find a finisher to close out the game. It works great in conjunction with our second uncommon, Harnessed Lightning. That card by itself is a very versatile removal spell, and if you’ve previously resolved a Glimmer of Genius or two, it lets you kill some really big creatures! Have your Energy token ready! I’m personally a big sucker for Lightning Axe. It’s another spell that can hit big creatures, it’s very cheap, the deck can often discard an excess land or in the best case, a Fiery Temper to kill two creatures for just two red mana. Rise from the Tides was discussed before, but Geistblast is one I don’t see people using most of the time. Sometimes, you just REALLY want to resolve a spell. Geistblast in your hand can double as discard fodder or a bad removal spell, but it has the most utility in your graveyard. People just forget about it, but doubling up a Glimmer of Genius or Lightning Axe can be a real gamebreaker. Hungry Flames has got me thinking about changing the uncommons around. 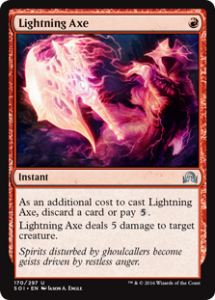 I like Searing Blood-type effects but is it really better than Lightning Axe‘s raw damage or Harnessed Lightning‘s versatility? Only testing and the metagame can tell. 1. 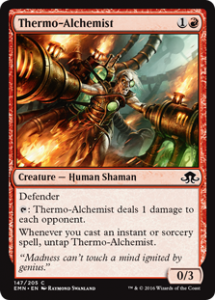 Must play cards: Thermo-Alchemist is obvious. Half of your deck triggers the little Alchemist’s ability. You put it down on turn 2 and it’s likely to deal upwards of ten damage over its lifespan. I didn’t put it in finishers but it sure gets you most of the way there. Two of them is just a mean clock. It’s also your best weapon against resolved planeswalkers. One of these guys can pick off a Gideon or Nissa in one or two turns. 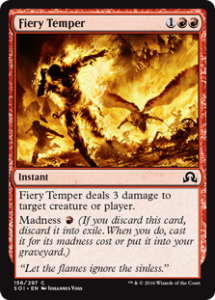 The second card that is just meant to be in the deck is Fiery Temper. Lightning Axe and this card are a match made in heaven! 2. Cathartic Reunion or Tormenting Voice? These are your best ways to fuel large Rise from the Tides. I like them in the maindeck but if I see my opponent playing blue I can be free to assume I will be up against Negates or Spell Shrivels, making these a risky play. Getting one of these countered is an easy way to lose the game. 3. Galvanic Bombardment or Shock? With Reflector Mage out of the meta, will we still see a lot of X/3 creatures? I’ve always run Galvanic Bombardment and I think I will watch the metagame develop before I make the decision to switch to Shock. The two damage to the face is usually irrelevant. 4. Counterspells in your maindeck? I definitely think it’s a possibility. I don’t like them in my list because it means I have to cut on either the critically few draw spells or lower my critical mass of removal spells. It’s definitely possible though, but you’ll have to make some major changes to deckbuilding. If I were to add them, I’d lean towards Negate and Spell Shrivel, as they have the highest number of available targets while being decisive enough counterspells. Dispel is a great sideboard card because everyone playing blue will bring in as many counters as they can afford to. 5. The selection on Pieces of the Puzzle says ‘may’. You don’t need to pick up instants or sorceries. This might help you set up Rise from the Tides or get an otherwise dead Geistblast in your graveyard. 6. While you want to build this deck around the rares and uncommons, be sure to define a landbase before you get started on the commons. In my case I had calculated that I’d hit most of my necessary land drops and have the right mix of red and blue sources on 23 lands. This gave me eighteen slots to play around with. Another way this could be done is by cutting two Cathartic Reunion and both Pieces of the Puzzle, and adding four Anticipates. This could let you dig into lands or win conditions at instant speed. If you’re expecting some high-powered non-creature win-conditions, you might even want Negates in your mainboard, like we mentioned before. Landbases in Gentry for two-color decks are pretty straightforward and you should be spending the least amount of time on these. With only commons at your availability, there isn’t much playroom. The deck doesn’t run that many blue spells and it needs a lot of red mana to continue throwing fire and lightning at your opponent and his creatures. My sideboards tend to be blue-heavy so I can just change how I fetch with the Evolving Wilds to have more blue available. The sideboard in Gentry is often a pain-point. You don’t want to cut any rares or uncommons from the main deck so you’re limited to just commons. If there’s any cards you don’t want to risk playing or cards that are just dead in the match-up, here’s usually where you put your alternatives. As I’m a blue deck, cheap counterspells and draw spells are the bulk. There are match-ups where I don’t want to risk the card disadvantage of having a Cathartic Reunion or Tormenting Voice countered. Take Inventory is a great alternative! There are match-ups where your removal spells are useless, this is where the counterspells come in. Negates, Dispels, Spell Shrivels are what you want. The rest I just fill up with cheap mass removal effects. The deck is weak to decks that go wide with a bunch of weak creatures, so I prefer Boiling Earth. It cleans up spirits, warriors, plants, servos, thopters and the odd goblin, and in the lategame it can also just provide a sizable blocker. I don’t see people playing this deck very often. With UW Blink gone, thanks to the ban on Reflector Mage, the deck lost its worst matchup. Hopefully, this means that people will pick up their red and blue spells again. Unless we figure out a new amazing deck in testing, I’m fairly confident in saying that I might be bringing these colors to the Invitational. It’s just too much fun! We did in-fact find a deck during testing that Spells had massive issues with. G/x +1/+1 counters, especially the GB version with Winding Constrictor, proved a tough nut to crack. Spells has a major issue with creatures that can permanently grow past their normal power and toughness, as you’re very limited in your removal. In Gentry, this hasn’t been an issue up until now as most creatures can be dealt with by Galvanic Bombardment or Fiery Temper, but when every creature they play grows past three toughness and starts requiring a Lightning Axe or oversized Harnessed Lightning to handle, it became obvious that the deck wasn’t the right choice. We never really had a chance to scout out the Ghent meta or testing, but from what we saw in our own limited testing, I thought it would be strong enough to define the Invitational with multiple players prepping snakes and dice. This prompted me to switch decks on short notice, opting for the Open-winning ‘Temurge‘ deck as it had a good matchup against all types of midrange decks, which I consider GB to be. Nobody ended up playing into our speculation and Michiel especially reaped the fruits of that labor, leaving his Flaying Tendrils at home and getting matched up against a tokens deck. I got to beat up a stock midrange list in my quarterfinals, but lost to some really good aggro draws in the semis from an old format staple, GR Energy, which I ended up losing in three games even with the help of Filigree Familiar to blunt their powerful offense. Next time, we’ll need to test some more. Conflicting schedules made it really hard to find some time, so we had to disappoint those looking to find some great new ideas at the Invitational. At the Gentry Open, however, we will be ready! Kenneth has been playing Magic since Khans of Tarkir. He’s a Modern format aficionado, most known for playing Infect. With the introduction of Gentry in Belgium, he’s ignited a new spark of building and honing decks. Aside from that, he’s trying to grow his competitive career. You’ll find Kenneth at most Grand Prix aiming for the coveted trophy!